Spray paint is one of my best friends. 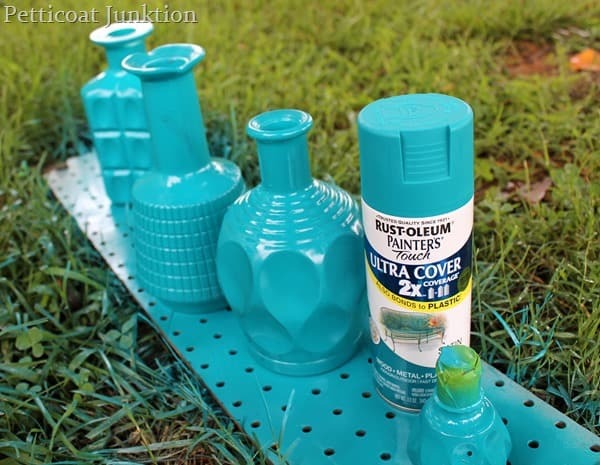 Did you know you can spray paint glass bottles, decanters, vases, milk bottles, etc.? You can! Be careful what you toss out. Look at things with a critical eye before tossing into the recycle bin or the trash. You might have new home decor on the cheap. 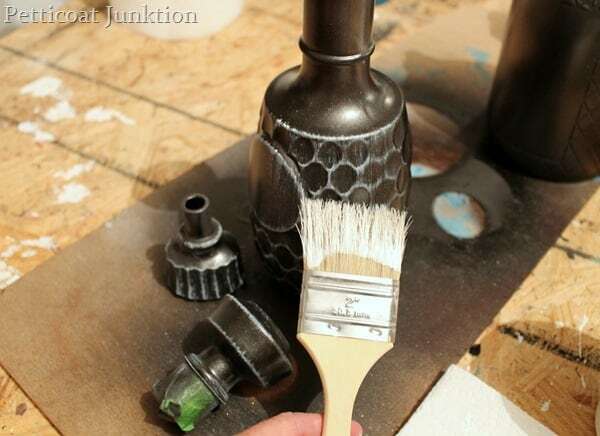 Spray paint is one of the easiest ways to upcycle, update, make new, any item. Canned spray paint has definitely improved over the years. Now you can spray paint just about anything and not only will it be beautiful but the spray paint will stick….for good. 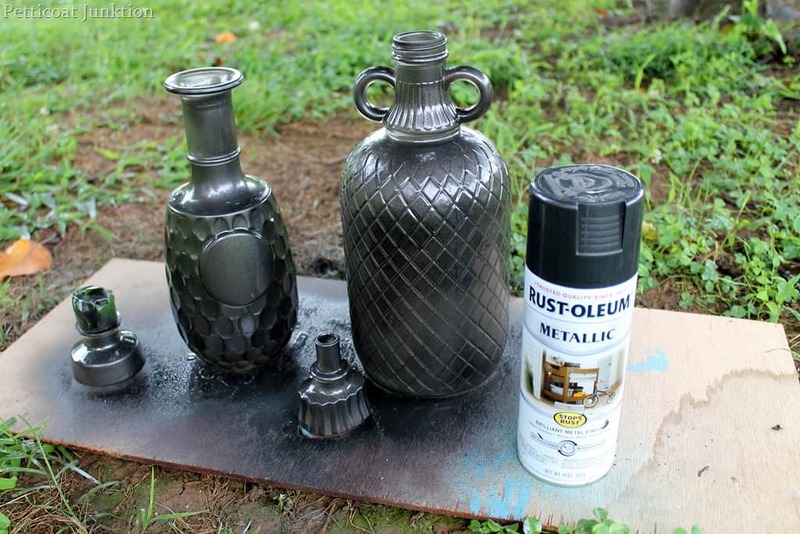 I used Rust-Oleum spray paint to beautify these decanters. Ok, maybe they aren’t exactly decanters but since this is a family blog I prefer to use this term. How about those glass stoppers too. Don’t overlook things like this. They make unique decorator items. I purchased several of the glass decanters at the Nashville Flea Market last month. On the last day of the market you can get some really good deals. I used Rust-Oleum Black Night Metallic on a few of the pieces. This is such a pretty color, deep and rich. Not black, not brown, not gray! And on the others I used Rust-Oleum Satin Lagoon. This is another of my favorite spray paint colors. Got to have a fun bright color. The knobs on my Nautical Makeover are satin lagoon, my detailed picture frames are satin lagoon, and my faux mirror with frame is sprayed with satin lagoon. Told you I loved this color. If I had to describe the Black Night Metallic spray paint I would say it is closer to a dark, dark, gray than black. After the spray paint was dry, I dry brushed white paint on the raised details. To do this you need to get paint on your brush then dab basically all the paint off on a paper towel. Your brush must be very dry. Then just swipe your brush over the details until you get the look you want. Trust me…..you’ll be surprised how easy it is! The flower bush came from Hobby Lobby. 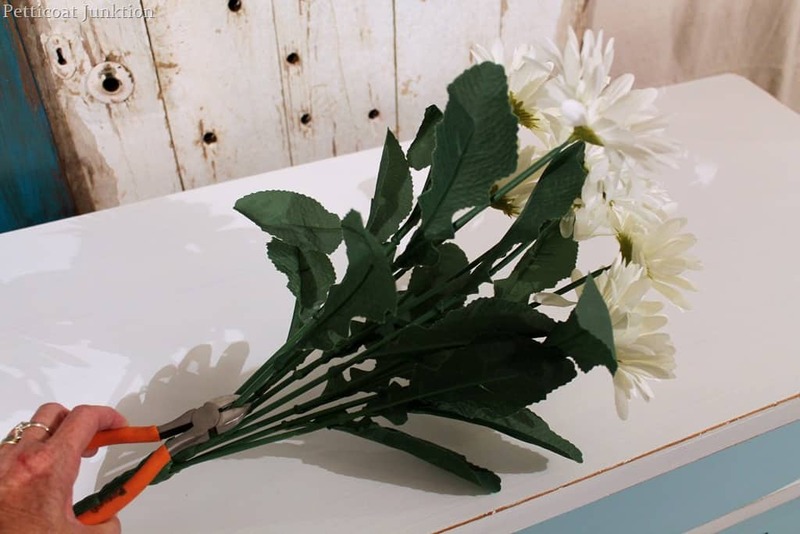 I cut the blooms apart with wire cutters. I love the contrast of the white with the dark bottles. It’s cute to put a small flower in the decanter stoppers also, but it was a little much for this display. Don’t you think painting the stoppers are fun! They do look great with small flower stems in them. Give it a try. Find my favorite spray paint colors on the Petticoat Junktion Amazon Page here. The pretty bottles make me smile and also do the happy dance. 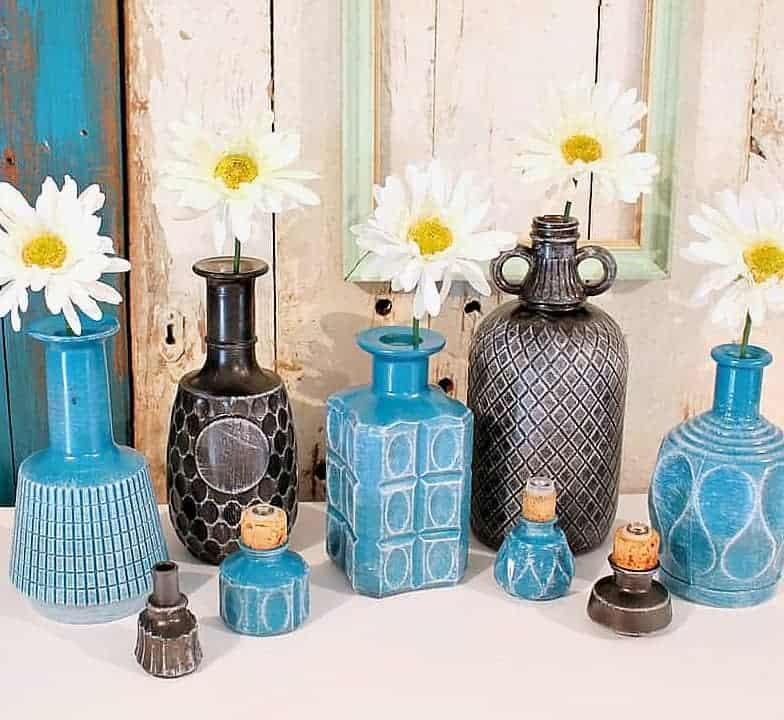 They looked great with my Aqua and White furniture makeover Do you like the colorful decanters? Or do you prefer the clear glass? If you’ve never dry brushed anything guess what. I have a video for you where I am dry brushing furniture. Same deal for any project. 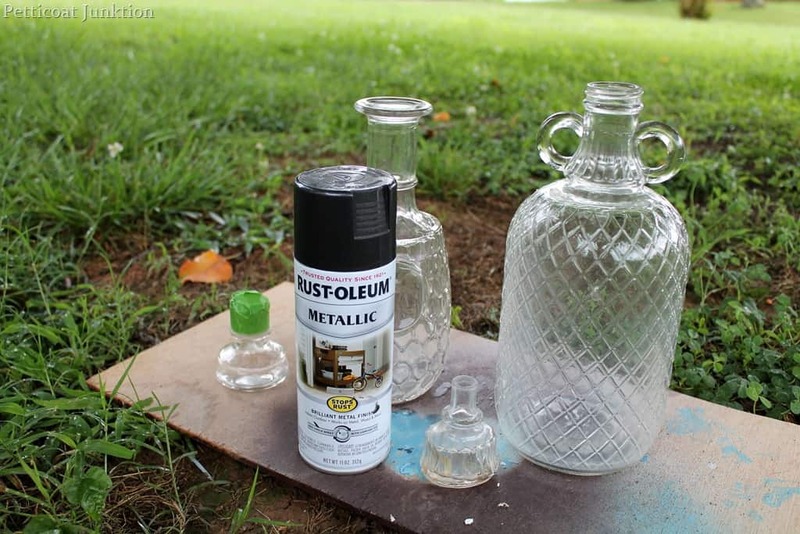 See the video…..
Did you know you could spray paint glass? I even use spray paint on furniture. At one time I considered this a no-no. I still haven’t spray painted a whole piece of furniture. Painting drawer fronts on a couple of projects is as far as I’ve gone with spray paint for furniture. One of my favorite turquoise projects has silver drawer fronts. 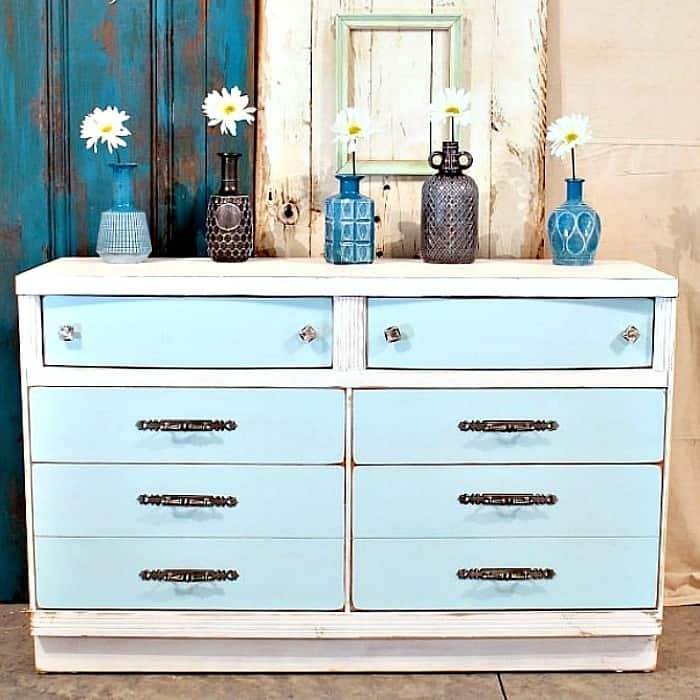 You can see it here….Turquoise and Silver Nightstand. Silver Metallic spray paint makes a nice contrast to white paint. I have a small side table with this paint finish. See it here…..White Table With Silver Highlights. This makeover also features Gold Metallic spray paint for the furniture pull. I know that you posted this on 9/13, but I saved it because we are doing a major “purge” of “too much stuff”, and I haven`t had a spare moment until today. I am so excited that you posted this tutorial! I have two storage boxes full of bottles and jars that are too full of possibility to throw away. I`ve tried a couple of painting techniques already and just wasn`t satisfied with the results. Your tutorial looks so easy, and the bottles look lovely! Is it just me, or do yours remind me of ceramic? Yes, I think they look like ceramics too! Maybe the type of spray paint? Glad I could give you a few ideas. I keep things too until I run across a good idea for repurposing them. We lived in the panhandle of Florida for a few years and we didn’t get much Fall weather either. Fall is my favorite time of the year! Thanks for your comment. I have a heavy hand with sprays of any type, but I certainly appreciate what YOU can do! Just found your site and love all of your ideas. This painted bottle idea is great. I have some leftover spray paint and will give this a try. Thanks Janey. Don’t let that spray paint go to waste! What kind of paint do you use for the dry brushing? Lisa, I used regular white latex paint! Turquoise is my color! Lovin’ it with the black & the white highlights are a great accent. Just took a little lookie into my ¨inventory¨& quickly came up with two decanters. Will have to see if I can find a few more. Definately going to try this! Thanks for a fab idea! One more way to reuse & upcycle – fantastic! Although I am not sure I can find room for any more “treasures”. My grandmothers would flip – spray painting glass/crystal – what?!? Michelle, It want run if you spray several thin coats! It is really easy to work with. love them, I’m definitely going to try this. Much cheaper than buying them. Thanks for the inspiration! I love how those turned out! Did you use any kind of primer or anything under the spray paint? I just tried to do a white glossy bowl – in a color VERY similar to lagoon (also Rust-Oleum)but it was glossy – the finish did not turn out very well. Hi Kathy! OMG I love this! Thaks so much for sharing this tutorial, I can’t wait to start experimenting on my many glass bottles. My only 2 questions is about cleaning them: I assume the spray paint stays on pretty well, but it’s probably just best to clean them using a soft damp cloth, right? I imagine soapy and maybe hot water would be too hard on the spray paint. Also, did you primer these before you sprayed them with your main color? Tnanks again, this is the best! Thanks Stephanie, I’m glad you like the bottles. Cleaning….really….I haven’t cleaned them yet…lol. Probably a damp rag would be fine. I didn’t clean the bottles before I painted them and the spray paint is awesome. It sticks great and I haven’t had any problem with it coming off, even when I banged them around! These look so great! I loved my visit to the Nashville Flea Market. I need to go on the last day next time and get some good deals! 🙂 Thanks for linking up to the B&A party! Love them! I save jars and even pick up neat bottle at garage sales. I’ve just recently discovered using spray paint on jars, much easier then using my acrylic paint, and sticks so much better. I haven’t tried the dry brushing on them yet, but I really like the dry brushing effect. Very nice! Thank you for sharing. I love these bottles. Great job, I can’t wait to try this. Oh how lovely!!! Will keep this in mind! Saw it via Hometalk. Thanks for sharing with us! Hi Kathy, Love your blog. Love this DIY! Saw your stuff on Hometalk. I think it depends on the overall decor as to whether I would prefer clear glass or painted items. These are beautiful! 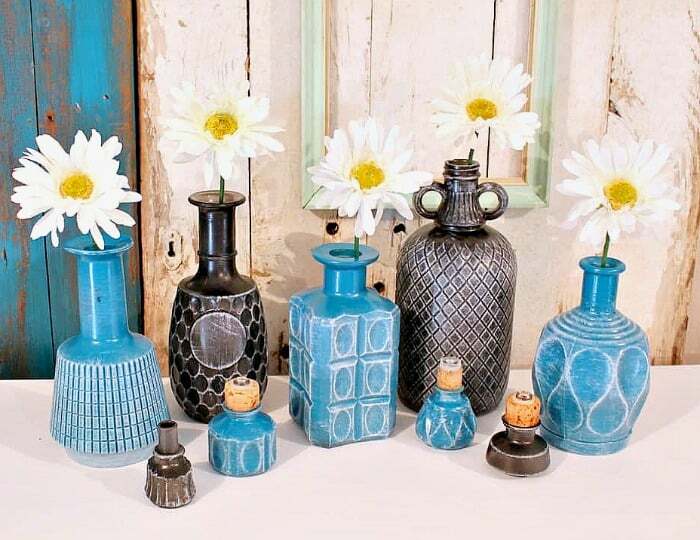 I saw piles of vases that looked exactly like this at Indigo this spring & they were a pretty penny, let me tell you! This is a thrifty way to achieve the same look for a lot less. Thanks for the tutorial! Hi Kathy, I found you over at Hometalk. This is a great idea! Your bottles look amazing. I would never have thought to dry brush them, but that was exactly what they needed. Thanks for sharing! I just washed a few cool looking bottles I want to reuse from the grocery store. When you use the mostly dry brush with white paint, how do you get it just on the details & not on the bottle? Did you use the corner of the brush to go over each raised line or swipe with all the bristles touching downwards while tipping the bottle? Hah if that makes sense! I am trying to dry out a cool olive oil bottle, but it doesn’t seems to want to completely dry up the oil inside when it air dries. Those are great ideas Kim. Thanks for sharing! Those are great Kathy!! I love them!